In a word, online reviews can be frustrating. When left to their own devices, customers who deign to leave a review usually fall into two categories: over-the-moon happy or incredibly upset. Very rarely does it occur to your middle-ground customers to leave a review, and this leads to a lopsided view of your company. Online reviews are picking up steam, and have become so ubiquitous that they’re now affecting search results for businesses. 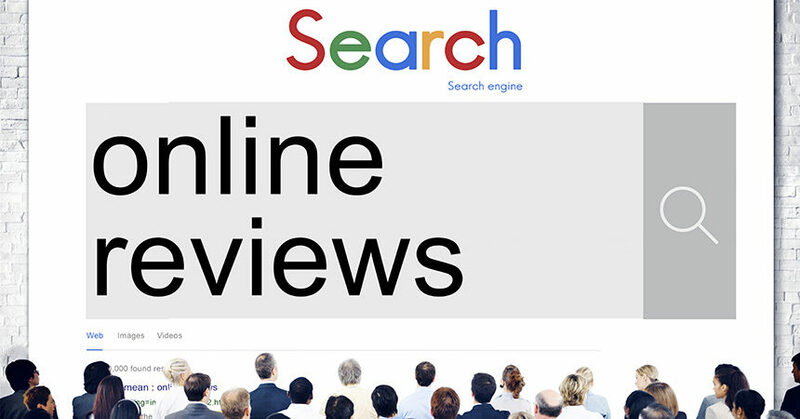 Previously, reviews seemed to remain contained to their own websites, but with the rise of Google and Yelp reviews, when your customers search for you online, your reviews are front and center. How do my reviews affect SEO? In addition to being a review destination, Google handles 40,000 search queries every second. If customers are searching for you, it’s a safe bet that they’re using Google to do it, which means they are definitely seeing your Google reviews. When you search for a business within Google, the page populates with top hits, but an info bar also pops up on the right-hand side. This contains your business contact information, hours, and whatever reviews Google deems “most helpful.” Whatever your customers are saying about you online is front and center. Yelp, arguably the most influential review destination on the Web, also comes into play in a big way in Google search. 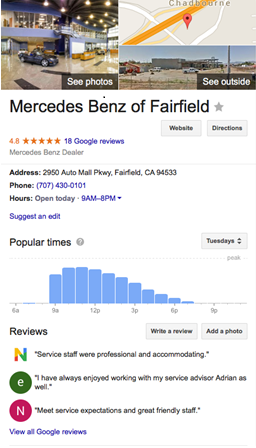 While Google prioritizes its own reviews, a business’s Yelp page shows up in the first page of search results—usually in the first 10 hits. These observations prove that when you’re trying to increase your Web presence, online reviews play a huge role. All the SEO in the world won’t help you out if your reviews aren’t up to par. How do I raise my online score? Create a culture. The simplest way to gather more positive reviews is to create a culture of awareness at your dealership. Train your employees on how to ask for feedback from their customers, and advertise the fact that you’re present on review sites. Effective management of your review pages is essential—reply to all reviews, positive and negative, and keep a current Yelp Check-In Offer to encourage your customers to interact with your page. Third-party solutions are also available to make it easy for your employees to ask for feedback. Create tangible reminders to review. Have something physical to give your customers that remind them to share their experience on your review sites. Custom “social cards” with links to a business’s review pages can be handed out to customers, along with their paperwork or a business card. Leverage your events. If you have a sales event coming up, use it to jump-start your review efforts. Create a custom check-in and have dedicated employees to engage customers on review sites and get them checked-in on Yelp. Note that Yelp tracks IP addresses, so keep the focus on checking in and awareness—not asking the customer to write the review in the dealership. Take advantage of the “happy customer” moment. 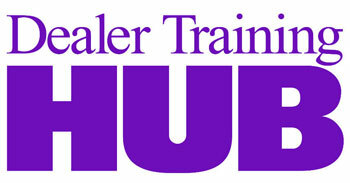 The best time to ask for a positive review is when customers have just bought a car they love. Third-party providers can make this process easy by providing apps that allow customers to provide feedback immediately, which is later emailed to them with an option to share. If you’re trying to shape up your search engine presence, it’s important to make sure everything your potential customers are finding is positive. Taking control of your online reviews is a great place to start.